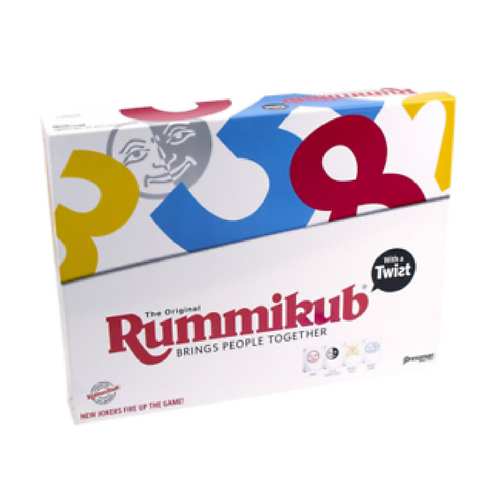 This version of Rummikub fuses the traditonal game with a fresh contemporary joker twist! This version of Rummikub fuses the traditonal game with a fresh contemporary joker twist! Add new excitement, strategy and fun with colour change, mirror and double joker tiles that will fire up your runs and groups, and keep your opponents second guessing. Rummikub is the game you try to use all your tiles in “Runs” or “Groups” to accumulate the highest score. Use the “Joker” to fire up the game, but beware if you are still holding onto him at the end of a round then you lose 30 points! Contains: 112 tiles, 4 racks, 8 rack holders, and instructions.